At work when an email comes through, “I have four tickets to Disney On Ice for tomorrow night, who wants them?” Faster than you could say “Oh boy” in a Mickey voice I snatched them up and soon, all four of us were packed into a car, fighting terrible rush hour traffic to see the opening night show of Disney On Ice: Worlds of Enchantment at the Oracle Arena in Oakland. Disney On Ice shows have been around for decades. 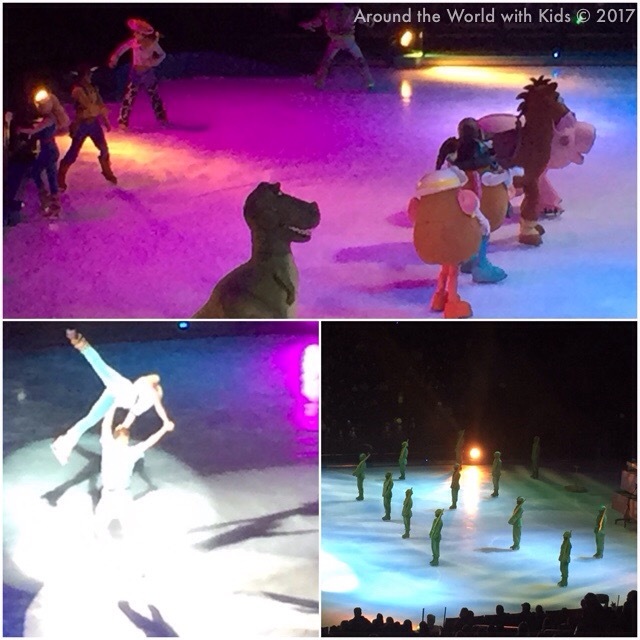 What used to be one show is now a variety of different shows where kids can see their favorite Disney characters skate live in front of them. 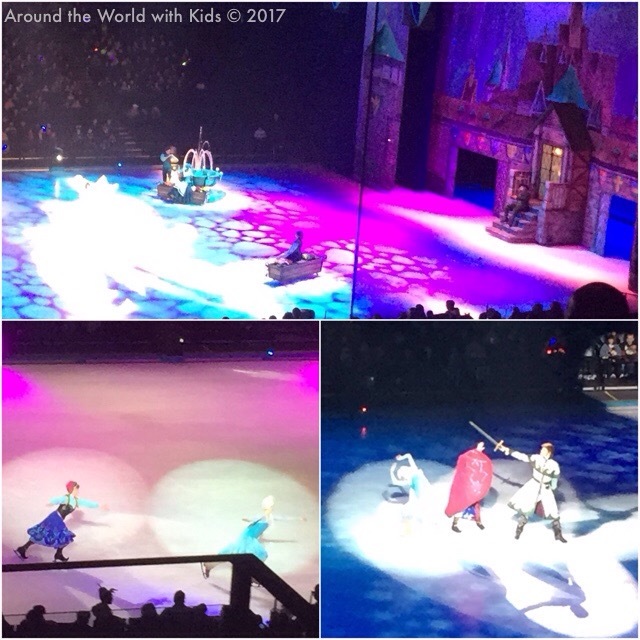 My children had never seen a figure skating exhibition, but they love all things Disney. Me, figure skating is my favorite winter sport to watch, so I was excited to view some feats of athleticism. The show is geared toward children and getting them involved. 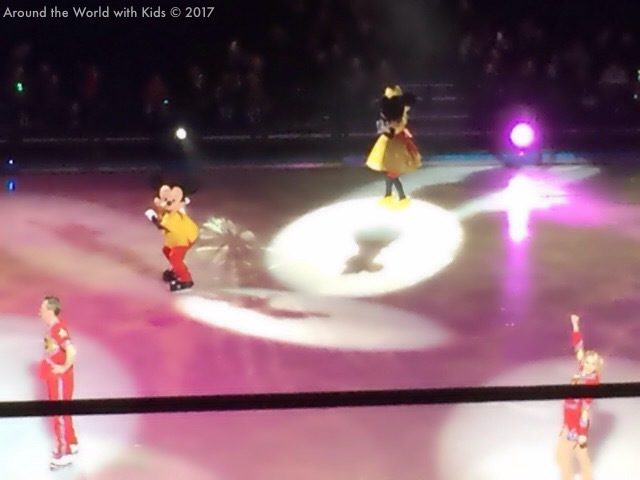 It official “starts” with Mickey and Minnie leading kids through a warm-up where kids are encouraged to get out of their seats and dance and hop with the skaters on the ice. Once the show officially starts, we see the hosts, Mickey, Minnie, Donald Duck, and Goofy, come out and do some dances, while coming in to help us transition between the four stories told on ice. The first is Toy Story, where it goes through a lot of the detail we see in Toy Story 3. Here, the best were Barbie and Ken. The two seriously shined with couple dances, side by side jumps, and beautiful lifts and holds. I thought this section of the show dragged out a bit too long, but that’s largely due to the time spent on showcasing the Barbie and Ken. The next segment was the Little Mermaid. This section was simply beautiful. Skaters covered the ice with spectacular costumes that emulated deep water sea life. The vibrant under the sea number was a spectacular for the eyes as the dances were lively on the ice. Eric and Ariel had a lovely number on the ice to kiss the girl. And the kids squealed in fake fear of Ursula. 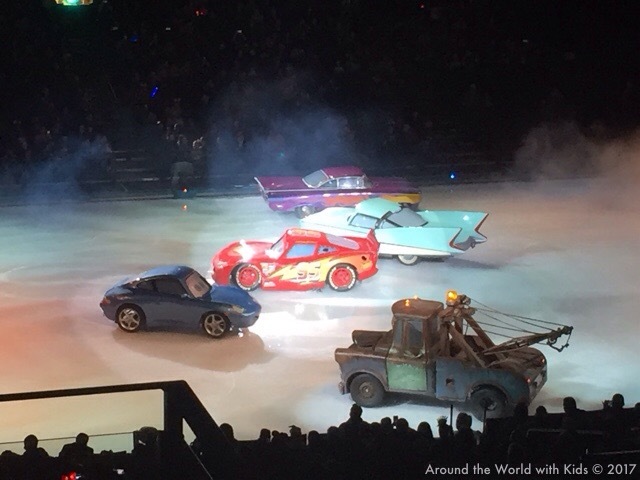 After a brief intermission, there was a short Cars segment. Unlike, all the other segments which did a short version of their respective movies, the Cars segment was actually a new story with a bit including Mickey’s car. I didn’t enjoy this segment as much because I love seeing the skaters. But I was impressed with what the cars could do on ice. And my son wholeheartedly stated this was his favorite segment. Finally, it ended on the segment that my daughter was waiting all night for. I’ll give you a hint, any little girl alive in the last few years have been singing this son on repeat. 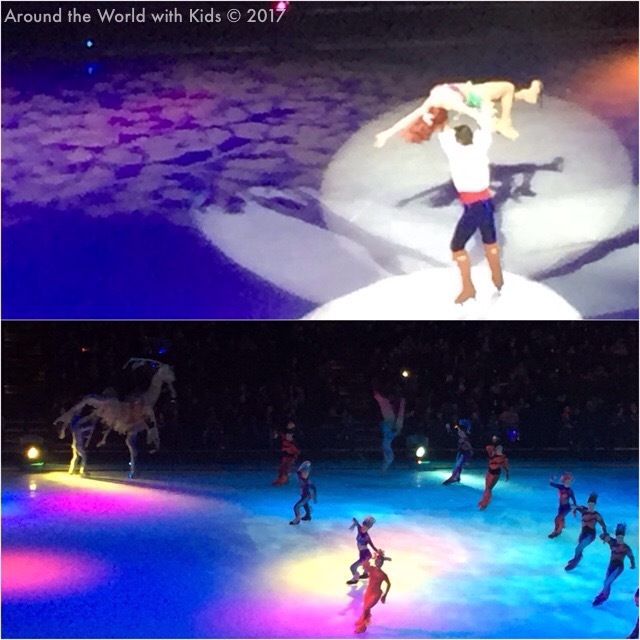 You guessed right, we were treated to a re-telling of Frozen but this time on ice (which seems appropriate). Anna, Elsa, Hans, Kristoff and Olaf all make an appearance as well as all your favorite songs. Elsa skating along the ice, with her strong jumps and powerful moves makes “Let it Go” that much more inspiring. The cute flowers and bees during “Summer” is fun to view. My only wish was that there was a better routine for Anna and Kristoff. We all loved the show. My daughter loved seeing Elsa on ice. My son, the Cars. For me it was the jumps and lifts. But my husband said it best. 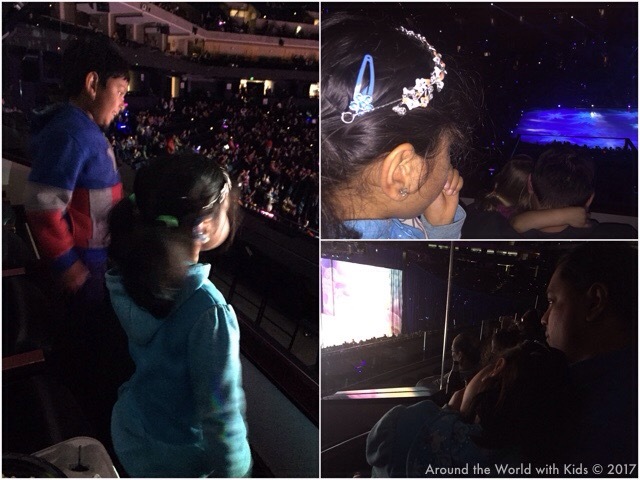 The best part of the show was watching the engagement and delight of our children. Watching them squeal when a bad guy came into the story, watching them yell out loud when they saw a character they loved, seeing them get up and dance throughout the show. It was an hour of traffic, a late night on a school night, and an expensive but unhealthy dinner from food we bought at the Arena, but all of that was worth it to see the delight and know we made wonderful memories with our children.